The United Nations Climate Change Conference, Durban 2011, will bring together representatives of the world's governments, international organizations and civil society. The discussions will seek to advance, the implementation of the Convention and the Kyoto Protocol, as well as the Bali Action Plan, agreed at COP 13 in 2007, and the Cancun Agreements, reached at COP 16 last December. Civil society participants will include trade unions, business associations, faith groups, environmental organizations, research institutes, etc. Climate Action Network International, with almost 600 member organizations in countries around the world publishes an on line and paper daily bulletin called ECO during negotiations. CANET has participated in climate negotiations since the United Nations Framework on Climate Change was first negotiated, and pursues common program and policy goals during negotiations. The Conference will be hosted by the Government of South Africa and will take place at the International Convention Centre (ICC) & Durban Exhibition Centre (DEC). 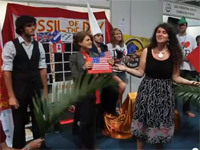 Hopes Fade for Binding Climate Deal as Durban Summit Enters Final Stages, Democracy Now! Climate negotiations in Durban, South Africa went almost 24 hours overtime and surprisingly ended with several important decisions centred on adaption, green climate fund, technology and strategies to support developing countries, being adopted. The conference included the seventeenth session of the Conference of the Parties (COP 17) to the UN Framework Convention on Climate Change (UNFCCC) and the seventh meeting of the Conference of the Parties serving as the Meeting of Parties to the Kyoto Protocol (CMP 7). The Kyoto Protocol, a sub-agreement under the UNFCC was signed in 1997 at COP 10 in Kyoto Japan, and came into force in 2005. It presently has 193 parties, including Canada but not the US. The Kyoto Protocol recognizes a "common but differentiated responsibilities" amongst the 191 national signatories to reduce greenhouse gas (GHG) emissions. Industrial nations - who are both wealthier and responsible for the bulk of the world's historic GHG emissions - are required to reduce their emissions by an overall average of 5.2% below 1990 levels during the first commitment period between 2008 and 2012. The Kyoto Protocol intended that a second commitment period and new international framework be negotiated and ratified by the end of 2012. Governments decided in Durban to adopt a new universal legal agreement on climate change that will apply to all countries no later than 2015. A new group called the Ad Hoc Working Group on the Durban Platform for Enhanced Action is tasked with implementing this goal. Although the details remain to be worked out, 38 industrialized nations, largely from Europe, also agreed to further targets and reporting under a second Kyoto Protocol commitment period beginning on January 1, 2013 and ending in 2017. "I salute the countries who made this agreement. They have all laid aside some cherished objectives of their own to meet a common purpose - a long-term solution to climate change," said Christiana Figueres, Executive Secretary of UNFCCC. A significantly advanced framework for the reporting of emission reductions for both developed and developing countries was also agreed, taking into consideration the common but differentiated responsibilities. Governments also agreed on the full implementation of the package to support developing nations, agreed last year in Cancun, Mexico. The package includes the Green Climate Fund, an Adaptation Committee designed to improve the coordination of adaptation actions on a global scale, and a Technology Mechanism, which are to become fully operational in 2012. "This means that urgent support for the developing world, especially for the poorest and most vulnerable to adapt to climate change, will also be launched on time," said Figueres. The next UNFCC Conference of the Parties (COP18) takes place 26 November to 7 December 2012 in Qatar. A day after returning home from United Nations Framework on Convention on Climate Change (UNFCCC) negotiations in Durban, South Africa, Canadian Environment Minister Peter Kent announced: "We are invoking Canada's legal right to formally withdraw from Kyoto." Under the terms of the Kyoto Protocol countries must give one-year's notice to withdraw. The Kyoto Protocol was signed in 1997 in Kyoto Japan and came into force in 2005. Canada adopted Kyoto by a vote of the House of Commons in 2002. It is a sub-agreement, under UNFCCC, which was signed in 1992 at the Earth Summit and came into force in 1994. Canada remains a party to, and still has international legal obligation to the UNFCCC. "I regret that Canada has announced it will withdraw and am surprised over its timing. Whether or not Canada is a Party to the Kyoto Protocol, it has a legal obligation under the [UNFCCC] Convention to reduce its emissions, and a moral obligation to itself and future generations to lead in the global effort," said UNFCCC Chief Christiana Figueres. "Not only has Canada just ended our commitments under an international treaty, I believe we are in violation of domestic law," said Green Party of Canada Leader Elizabeth May, referring to the Kyoto Implementation Act, which remains law in Canada. May also added that to her knowledge, this is the first time in history that Canada has reneged on a ratified international treaty. "It's a national disgrace. Prime Minister [Stephen] Harper just spat in the faces of people around the world for whom climate change is increasingly a life-and-death issue," said Graham Saul of Climate Action Network Canada. "Withdrawing from the Kyoto Protocol is a reckless and totally irresponsible act," said Ian Fry, lead negotiator for the tiny South Pacific island nation of Tuvalu who faces severe risks from rising sea levels caused by climate change, adding "For a vulnerable country like Tuvalu, its an act of sabotage on our future." "It is regrettable and flies in the face of the efforts of the international community for Canada to leave the Kyoto Protocol at a time when the Durban meeting, as everyone knows, made important progress by securing a second phase of commitment to the Protocol," said China's Foreign Ministry spokesman Liu Weimin. German Environment Minister Norbert Röttgen called Canada's announcement "unnecessary and in that respect very unpleasant." An official in India said Canada's decision could jeopardise any gains made at the Durban meeting. Even Japan, who like Canada and Russia was unwilling to sign up for a second commitment period under the Kyoto Protocol at climate negotiations, urged Canada to stay with the Kyoto framework. 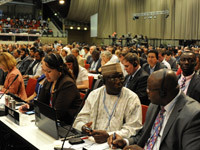 After two weeks of negotiations in Durban, South Africa, at the 17th Conference of Parties (COP 17) under the United Nations framework convention on climate change (UNFCCC) talks went into the night for text to be presented on Saturday, December 10, 2011. The Kyoto Protocol first reporting period ends in 2012, with civil society and southern/undeveloped countries seeking to extend the Protocol or/and replace it with a new binding and fair agreement. It is widely reported that Canada will pull out of the Kyoto treaty before the end of 2012, and South Africa's high commissioner to Canada has accused Canada of "bullying" developing nations to pull out of the Kyoto Protocol. "Kyoto, for Canada, is in the past," Canadian Environment Minister Peter Kent told COP 17, as six members of the Canadian Youth Delegation stood as Kent began his speech and turned their backs, revealing the message "Turn Your back on Canada" on their T-shirts. Neither India nor China is in the annex under the first commitment phase of the Kyoto Protocol, as they are as developing countries under Kyoto. But rapid industrial development in both countries has made China and India the world's first and third largest emitters. 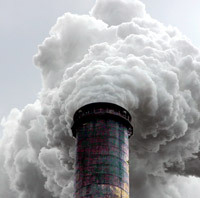 Canada, Japan and Russia, have refused to take on new targets under the Kyoto Protocol after the existing commitment period. They insist any new agreement needs to include greenhouse gas (GHG) emissions from developing countries like China and India. The United States, which signed but never ratified Kyoto, also supports this position. India wants a second commitment period for the Kyoto Protocol, provided it respected India's need to ensure development for its people, and eradicate poverty. China indicated it is prepared to enter into a binding deal to reduce emissions, but said it expects developed countries to take on a new round of targets following the end of the Kyoto agreement's first commitment period. "What is frustrating me and my delegation here ...is to see for the third time that this UN conference is hijacked by a Ping-Pong game between the United States and China," said Jo Leinen, chairman of the European Parliament's environment committee. Youth delegations have been active and visible throughout the two weeks in Durban. Kristin Palitza, News Report: Chanting slogans and signing protest songs, a large throng of demonstrators walked from Durban's city centre to the entrance of the International Convention Centre where the climate change summit is being held, to hand over a list of their demands to Christiana Figueres, executive secretary of the United Nations Framework Convention on Climate Change (UNFCCC). Civil society requested that governments meet various targets by the end of the conference on Dec. 9, including ensuring a peak in global greenhouse gas emissions by 2015, and that the Kyoto Protocol continues and provides a mandate for a comprehensive, legally binding instrument. A Greenpeace International report, Who's holding us back? 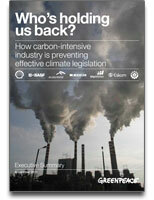 How carbon-intensive industry is preventing effective climate change legislation, released November 23, 2011, hopes to influence climate change negotiations in Durban November 28 — December 9, 2011. “Greenpeace calls on the politicians who hold the fate of our economy and environment in their hands in Durban to listen to the people instead of polluting corporations like Shell, Eskom and Koch Industries.” said Kumi Naidoo, Executive Director Greenpeace International. The report demonstrate that decisive action on the climate is being ousted from the political agenda, as businesses that contribute the most to climate change emissions, and who are profiting from these activities, work to defeat progressive legislation on climate change and energy around the world. The report reveals, using clear case studies, how a handful of major polluting corporations such as Eskom, BASF, ArcelorMittal, BHP Billiton, Shell and Koch Industries, as well as oil industry associations, influence governments and the political process on climate legislation. The report says Ottawa and Alberta have been partners in a taxpayer-funded "advocacy strategy" led by Canada's Foreign Affairs Department to fight climate-change policies and "pro-mote the interests of oil companies." Canada, along with Japan and Russia, have indicated they plan to walk away from any climate deal that sets greenhouse gas emission reduction targets for developed nations between 2008 and 2012. At an historic meeting in Ottawa, October 23rd and 24th, faith leaders, politicians and members of the public gathered to engage in a dialogue about climate change. Participants discussed climate change as the root of a spiritual crisis, the values necessary for a sustainable economy, and the challenge of climate justice. A joint statement "Canadian Interfaith Call for Leadership and Action on Climate Change" was developed in advance of the 17th Conference of the Parties to the UN Framework Convention on Climate Change, to be held in Durban, South Africa, November 29th to December 9, 2011. "We call for leadership to put the long-term interest of humanity and the planet ahead of short-term economic and national concerns. The teachings of our faiths tell us that the best interests of one group or nation are served by pursuing the best interests of all people. There is one human family and one Earth that is our common homeland. Climate change is a global crisis and requires global solutions that put the well-being of all people first - especially the most vulnerable," reads the joint statement signed by nearly 30 religious leaders and representatives of faith based organizations across Canada. Despite the global economic crisis, the world's largest investors urged governments and international policy makers to take new and meaningful steps in the fight against climate change. In a joint statement, the group of 285 investors representing more than $20 trillion in assets, stressed the urgent need for policy action which stimulates private sector investment into climate change solutions, creates jobs, and is essential for long-term sustainability and stability of the world economic system. Investor support for climate action has more than doubled since November 2008, when 150 investors with $9 trillion in assets first came together to urge government leaders to act on climate change. Coordinated by three leading investor groups on climate change, alongside the United Nations Environment Programme Finance Initiative (UNEP FI), and the Advisory Council of the Principles for Responsible Investment (PRI), the statement represents the largest ever grouping, by both number of signatories and assets, to call for policy action on climate change. The statement is supported by the findings of a report commissioned by the three investor groups and UNEP FI. This report underscores investment-grade policy which will enable institutional investors to allocate capital towards climate change solutions. Contained within the report are case studies on the climate policies of six major emitters and further examples of investment-grade policy for national governments and negotiators considering future policy initiatives.